Location: BPP Law School (London). This event is exclusively for students. Please register for this event (see above eventbrite page for details). LPHR and Al Mezan submit comprehensive complaint to the United Nations concerning large-scale destruction and damage to family homes in the Gaza Strip with associated profound loss of life and injury to Palestinian residents, during Israel’s military operation between 7 July 2014 and 26 August 2014. LPHR and Addameer submit complaints to the United Nations concerning the Israeli detention of two female Palestinian human rights defenders: Ms Shireen Issawi and Ms Bushra al-Taweel. LPHR and Addameer provide update on the continued detention of the Palestinian human rights defender, Murad Shtaiwi, under Israel’s repressive protest law. LPHR Press Statement: G4S to be investigated by the OECD UK National Contact Point following LPHR comprehensive complaint relating to alleged Israeli human rights violations. This news is reported in the Financial Times, the Daily Telegraph and the Guardian. LPHR Student Network held a film screening at the University of Law of Stone Cold Justice followed by an informative Q&A on the issue of Palestinian child detainees under Israeli military arrest and detention with Sir Geoffrey Bindman QC and Jude Lanchin. 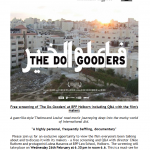 LPHR Student Network held a film screening at BPP Law School of The Do Gooders followed by an illuminating Q&A with director Chloe Ruthven and the film’s main protagonist Lubna Masarwa. LPHR and Defence for Children International Palestine launch its “Know Your Rights” campaign to educate and empower Palestinian children to secure their basic rights. 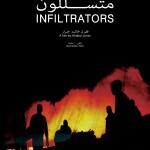 Following our AGM, we were delighted to hold a public film screening at the elegant Mosaic Rooms of Khaled Jarrar’s award winning 2012 documentary film on restriction of movement, Infiltrators. LPHR submit complaint to the OECD UK National Contact Point against conduct of the security group G4S in Israel and the Occupied Palestinian Territory. We were delighted to hold a public event with Colonel Desmond Travers and Daragh Murray as part of our AGM. 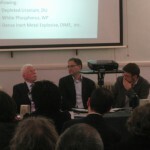 Desmond Travers – one of the authors of the ‘Goldstone Report’ – discussed Gaza post ‘Operation Cast Lead’. Daragh Murray told us about his experience working for the Palestinian Center for Human Rights in Gaza. Speaker: Hassan Jabareen from Adalah. Chaired by Sarah McSherry. 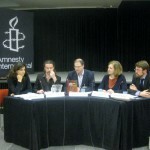 We were delighted to hold a seminar marking the launch of the book ‘Is there a Court for Gaza’. Dr Michael Kearney, Dr Chantal Meloni, Daragh Murray and Stephanie Barbour discussed key issues raised within the book in an event chaired by Daniel Machover. To watch interviews of our speakers, click here. 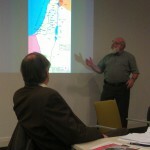 Speaker: Jeff Halper from Israeli Committee Against House Demolitions. Chaired by Sir Geoffrey Bindman QC. Speakers: Gerard Horton from Defence for Children International – Palestine Section and Richard Hermer QC from Matrix Chambers. Chaired by Sarah McSherry. 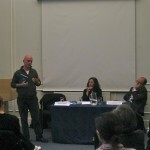 We were delighted to welcome three prominent Palestinian Human Rights Defenders who discussed urgent human rights issues in the Occupied West Bank (including East Jerusalem) and Gaza. 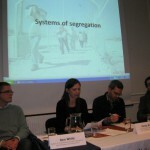 27.10.2011 Charity Launch of Lawyers for Palestinian Human Rights: Inaugural AGM, followed by an evening with comedian and writer Mark Thomas and closing comments from Sir Geoffrey Bindman QC. 14.01.2009 Daniel Machover appears in a Newsnight special edition programme on the topic of War Crimes committed in Gaza by the Israeli army. View The Case for War Crimes and The Debate over War Crimes. 07.01.2009 Read LPHR’s Legal Questions and Answers Relating to the Conflict in the Gaza Strip. 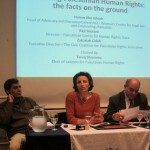 27.12.2008 –> onwards LPHR responds to Israel’s attacks on Gaza through a series of urgent actions and protests. 16.09.2008 LPHR hosted Raja Shehadeh (writer, lawyer, founder of Al-Haq and author of Orwell Prize winning ‘Palestinian Walks: Notes on a Vanishing Landscape’) who gave a talk entitled “Disappearing Territory: Israel’s Occupation and Palestinian Land”.